It worked more or less out of the box. After threading it (thought you might have left a bit more cotton on!) my wife was sewing a hem on a dress 20 minutes later. It sews an extremely neat 2 mm finish out of the box and we haven't changed that yet. Initially starting sewing the machine sounded as though it wouldn't move but after checking everything and pressing on it worked smoothly and quickly. It just sounded differently to our old machine. Threading is easy using the tie on method but the bottom looper will still be tricky (but not difficult) Your service was top class; you kept us informed of the delivery by email and the tracking of the order was brilliant! All in all we are very pleased with the machine, the price and will recommend GUR to all our friends. Thank you. Ordered a Jaguar 489 2/3/4 thread Overlocker - on a Tuesday after an online chat , it was delivered next morning well packed and ready to go. 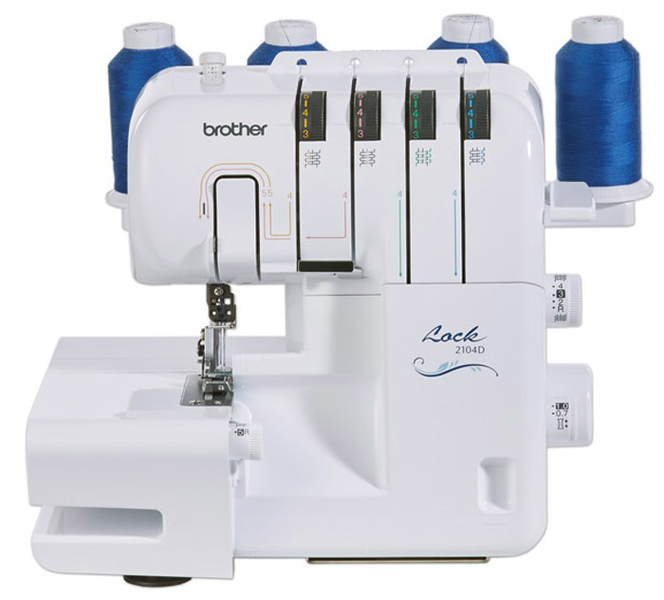 there was a price alert on this machine, with also 50 free reels of thread and 5 different feet which have been really useful. Machine is a dream to use. 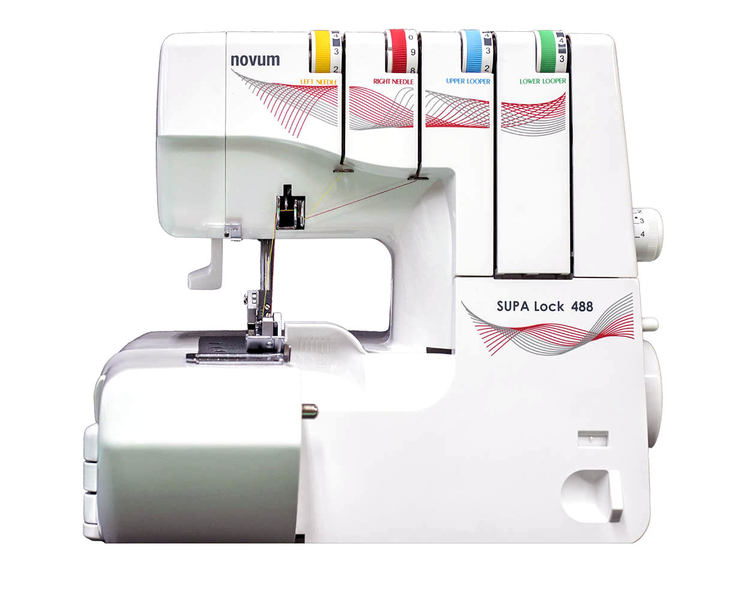 I would Recommend this machine and definitely recommend GUR for sewing machines and their service. Exceptional service , ordered thurs evening, delivered monday afternoon. Kept informed of order progess along the way and given the option of changing the delivery time with plenty of notice, which not all companies do. The Novum Supalock is a sturdy bit of kit, with a robust feel to it. As a complete beginner I wanted a machine that was easy to use and thread. It is, and the instructional dvd on threading was extremely useful. The paper manual is thorough, haven't had to resort to you tube videos to be able to use it! In my opion the stitch quality is very good, my only frame of reference for that is a comparison with a Janome overlocker that i've used in my beginners sewing class. I think the Novum is the better machine. Excellent customer service and value for money!..... 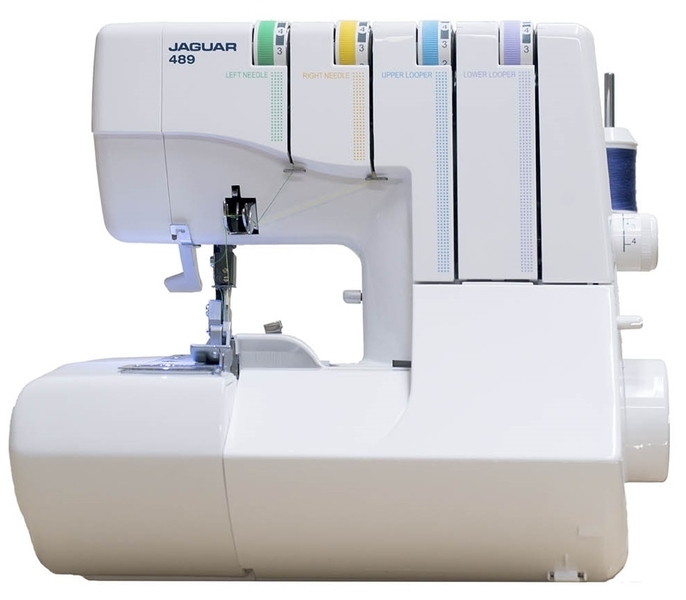 I finally purchased a Jaguar 489 overlocker after doing loads of on line research and also having spoken to GUR about several models and weighed up their very helpful advice. On receipt, at first I struggled to get the stitches correct, being my first ever overlocker, but having called GUR for advice, I received a phone call from Palma, who talked me through the correct settings, I persevered and sent photos of the results of my test stitches at different settings through, as he suggested. Palma then took the time to call me again and look at the photo samples with me, explaining things very thoroughly. He also sent me the free January offer of a handheld steamer immediately when I queried if I was eligible, so all in all, I cannot fault the customer service I received, it is refreshing to get such great pre and post purchase support. I highly recommend GUR and will certainly be buying again from you again, and thank you for your patience as a novice overlocker sewer! And finally, after speaking with Palma only two days ago for advice, I have now made my first knit fabric item, ever, and all on the Jaguar. It was so quick and easy to do, and looks great! Bought this a couple of years ago as an upgrade from my old Frister Rossman machine, which works perfectly but is over 30 years old. 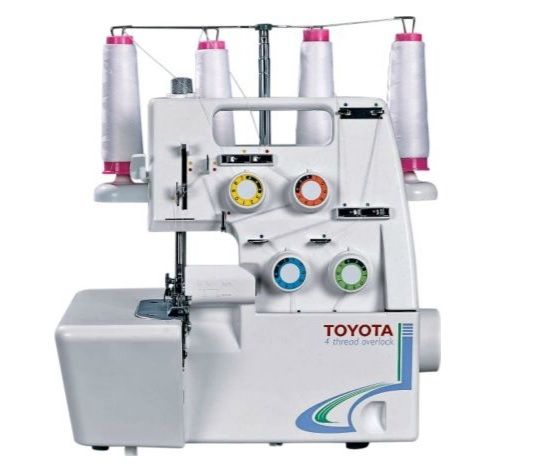 It is a lovely machine, easy to operate and threading is a breeze. It was on sale when I got it and very good value for money. As far as I am concerned, the only negative is that it is quite noisy, however a noise reduction mat has greatly reduced that problem and I hope to be using my overlocker for years to come. Until now, I have never owned an overlocker until now. I was trying to sew some stretch fabric, but with a standard sewing machine, it was having none of it. So I spoke to a very helpful gentleman on the phone, I explained to him, the type of fabric I was using and what I was looking to achieve. Immediately he recommended this machine for me. So I went and purchased this Jaguar 489 Overlocker. It is very simple to thread and to clean, even for a total novice like myself, as the front opens up and swings out the way, very smart. 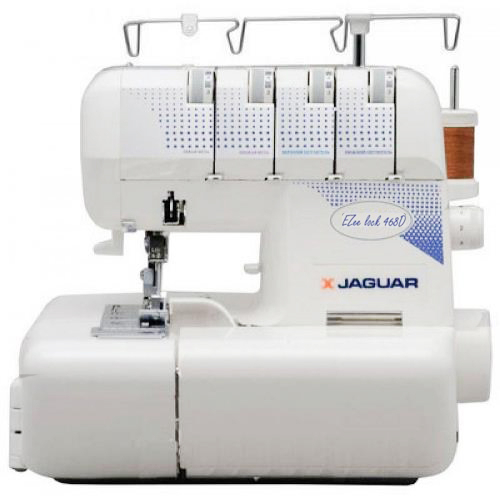 You will not be unhappy in any way if you buy this Jaguar 489 Overlocker. I love it, only had it a few weeks, already made 3 shirts, a top from my stretch fabric, and will finish a shirt later. An extremley happy customer!! 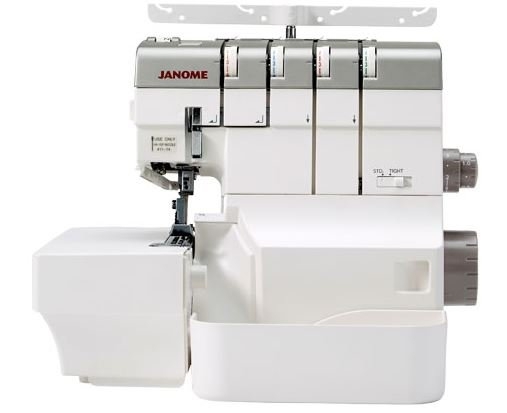 I am really pleased with this new machine, i was going to buy a Janome until i read the reviews on this one and i am happy to have changed my mind. The carriage was extremely quick and arrived within a day of ordering, it was packed very sturdy and came already threaded, although i have used an industrial overlocker previously, this is the closest to industrial quality, so i was familiar with how it all worked. I would have no hesitation in recommending this machine and all its features, which i am still trying out at the moment. I bought this overlocker, my very first, just over a month ago. 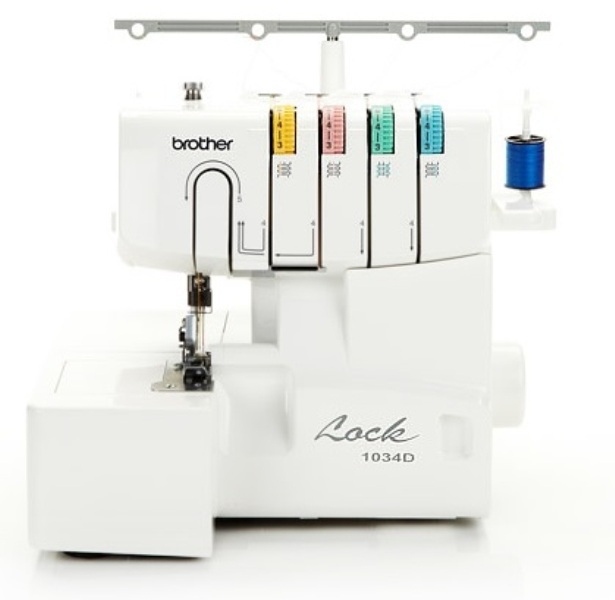 I had read many reviews on various overlockers concerning threading issues and was sceptical about getting an overlocker but this machine is so easy. In fact it’s excellent. 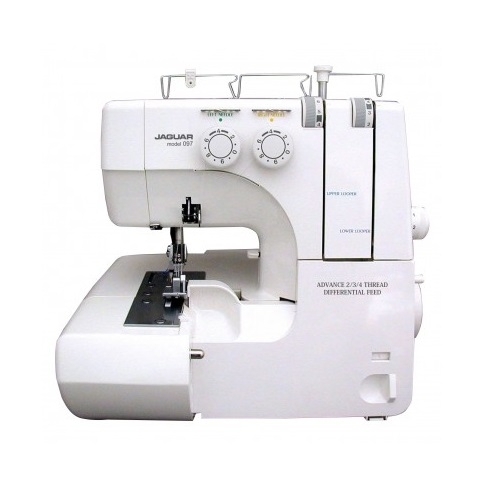 It’s a very durable beast of a machine that does not worry at any fabric you put through it. If you are reading reviews to make up your mind then look no further. This is a wonderful overlocker and if you still haven’t made a decision, give GUR a call, they will speak to you and offer the best advice. Their delivery times and customer service is also a breath of fresh air. I am happy with this machine. It is easy to thread as it opens up, and is clearly labelled so you don’t have to get the manual out when you want to thread it. Stitches are relatively neat and it does the job. 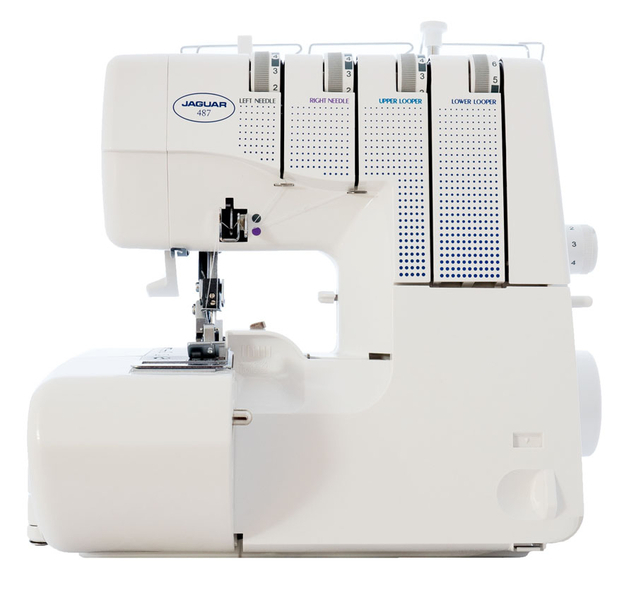 There are no bells and whistles and although it is fairly noisy but all in all a good budget machine that does what you need an overlocker to do. I haven’t really tried any of the other feet or fancy stuff like rolled hems but I’m sure it will be just fine. Thanks! Received my Jaguar 487 Overlocker in excellent time after placing the Order. I am so delighted with this machine. My ancient overlocker was very frustrating , so much time wasted trying to thread the machine. The Jaguar i487 is easy to thread. The machine came already threaded ,including 4 spools of thread ready for use. My sample produced a professional finish. I made the right choice at a very good price. 5 Stars. Thank you to the gentlemen that sold me this machine! Absoloutly amazing service, so genuinly helpfull and want you to do well! I cant beleive you get a 5 year warrantly aswell! So impressed! Cant wait to use it! The service I received was excellent.I ordered late in the day and Steven still managed to ensure I received my Brother overlocker the next day.I have been using it constantly since and am very pleased with it.I wish I had purchased one years ago.I would highly recommend the Brother, especially if like me you are getting to know all the knit fabrics which are now on the market.Thank you again GUR for your service. Bought this already some months ago, but wanted to test it before leaving a review. After many shirts and pants for kids I'm extremely happy with my purchase. There have been no mechanical problems, re-threading is easy to fix even if a thread breaks, the sewing quality is great. The customer service from GUR was also outstanding, they answered all of my many questions and the machine was delivered quickly and without any problems even overseas. I purchased my Jaguar from my local sewing centre. I felt I needed the peace of mind that, if I had no clue what I was doing with my machine, some one on one assistance might be invaluable. Well, this machine rocks. I was nervous about re threading it, especially after hearing the sewing centre lady say some customers go back several times for rethreading help before they 'get it'. I broke One of my threads, I managed to get it re threaded within minutes. I'm thrilled. It does a lovely, uniform stitch and I can knock together kids pyjama bottoms or tops in less than 30mins. All this, from someone who had never even switched an overlocker on 2 1/2 weeks ago. It's a fantastic unit. Cover stitch never worked, called gur services, they said they will call me back and go through the threading and see if that helps but never actually called back. I even took it to the repair shop and they said it’s the worst machine for cover stitching. So really I wasted my money on this machine :( not happy ! GUR REPLY: We are sorry to have let you down, we have made 3 phones and emailed but have had no reply from youself.....Please phone and we will try our best to sort out any issues you may have. Everything was first class- the advice- the offers- the delivery- the machine is quick, easy to thread, sturdy- chatted on line and from enquiry to using the machine for the first time couldn't have gone any better. Would recommend to friends and family. I was in 2 minds for the Brother 1034D or The Jaguar Supa Lock 486. Wife suggested the Jaguar and we took delivery the following day, shes had the machine for 8 weeks and so far no complaints....therefore I am a happy man....No moans or groans. Gursewingmachines serious and courteous service. I am very happy with my machine. Delivered in FRANCE. What a machine, love it. 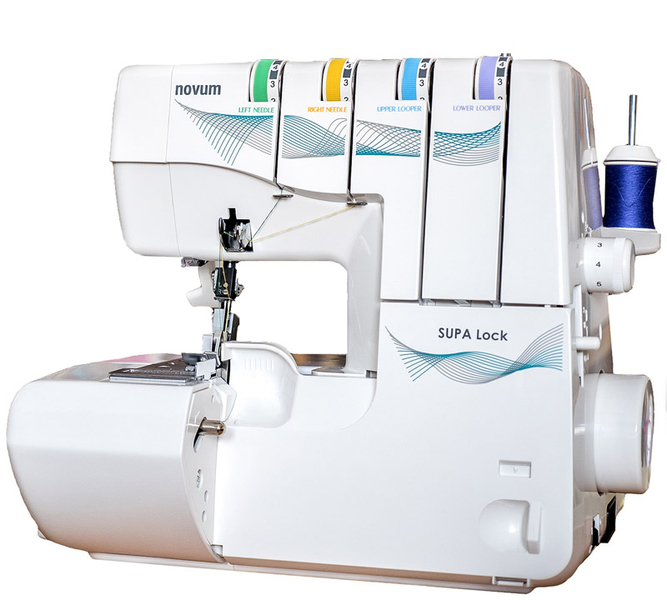 I got rid of my Frister Overlocker as I had too many problems to list... My new Novum Supa lock which I have had for 5 months has been amazing, its coped with all types, layers of fabrics without any hiccups, giving me fantastic results around my new home. so far I have achieved making new pair of curtains, cushions and chair covers......will recommend this overlocker to anyone for ease of use and threading. My husband bought me the Jaguar 487 overlocker for Christmas. 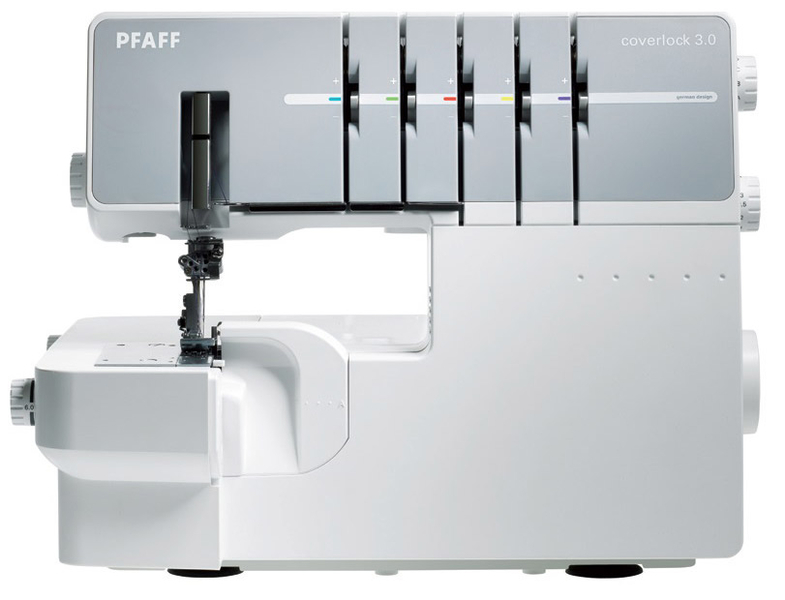 I had been reviewing overlockers since mid November on various sites and YouTube . I don't have a huge choice of sewing machine stores nearby and I was a bit dubious of purchasing something like this without having a trial run. I have never used an overlocker before so I really was relying on reviews of other users and purchasers and so know how important it is to get a detailed review of each aspect of the experience. I had been on the GUR website amongst others several times since the summer as I was also looking for a sewing machine to restart the hobby of clothes making and household crafting I had let lapse for about ten years. I have a daughter studying fashion who was in need of an overlocker and sewing machine to help save on the late hours in college so we borrowed my mothers singer sewing machine and I decided I'd try and get hold of an overlocker for her, then I discovered how much you can achieve with an overlocker via all the websites I had been visiting...so I decided I could certainly sort several problems at the one time. 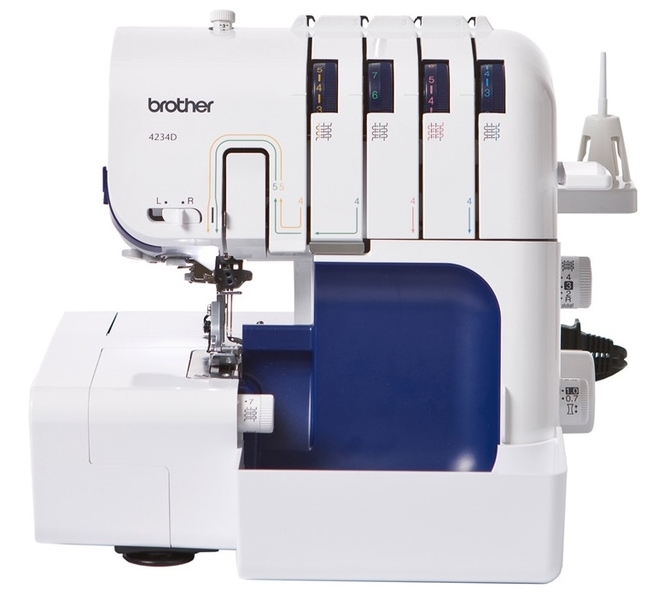 I compared overlockers on the GUR site and amazon site and saw that the Brother 1034 for £189.00 had several really good reviews, was good value for money for an entry level machine but would it actually be sturdy enough for an art student and her challenging variety if materials? 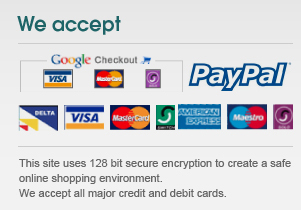 The last thing I wanted was to buy a machine that would not be up to our requirements. I went on GUR Facebook page and left a comment about the various overlockers I was researching at that stage requesting any feedback. I got a reply from Billy from GUR commenting on some of my choices also suggesting I phone for further assistance. I phoned on December 20th and spoke to Steven who was a mine of information and went through the 5 machines I was considering . He was patient, knowledgable and explained the differences with the machines, deciphered what I would most likely require and guided me towards the Jaguar 487. He said this machine would be sturdy, capable of dealing with my daughters projects include from basic lightweight seams to heavy materials while at the same time being fully capable of allowing me to explore the various crafts I want to do and easy enough for me to keep in working order, thread and service with telephone assistance if required. He also explained that it would be highly unlikely I would receive the machine in time for Christmas but that he would try his best to get it dispatched ASAP I said this didn't really matter as I would not be using it before Christmas at that stage. The machine arrived in Ireland at my front door before 9 am on 24th Dec, in time to be wrapped and placed under the tree! Happy days! I was very impressed with every aspect of my experience with GUR on receipt of the machine and would have given a review of my experience at that stage but I hadn't opened or used the machine at that point and in reading reviews during researching it was one of the things I found least helpful - reviews about the great service and speedy delivery but no feedback on the specific machine. The Jaguar 487 is easy to thread as each route is colour coded , easy to access the the workings under the needle plate as this part can swing all the way open allowing a very clear view of all the mechanism housed here ( so I can see what Steve was saying about being talked through any repair/ service via a phone call ). The manual that comes with it is very comprehensive, the only part that wasn't that clear was the exact points to apply the oil to but I looked that up on YouTube as I had taken note of that information during my research. We changed threads for a couple of skirts my daughter is working on and I found it easy enough to explain and demonstrate to her how it all works ( I thought she would know more about it but so far they have just been using the overlockers in college for edging single layer seam allowances) We had a bit of a play around with diff tension, stitch length, stitch width and over edge cutting width, threading referring to the manual when we weren't sure what we had adjusted. We were impressed with the speed, clean cutting seam edge, sturdiness, manual and ease of use. There is a scrap collection bin that attaches neatly to the front of the machine, which also attaches in an upside down position when the machine is not being used. 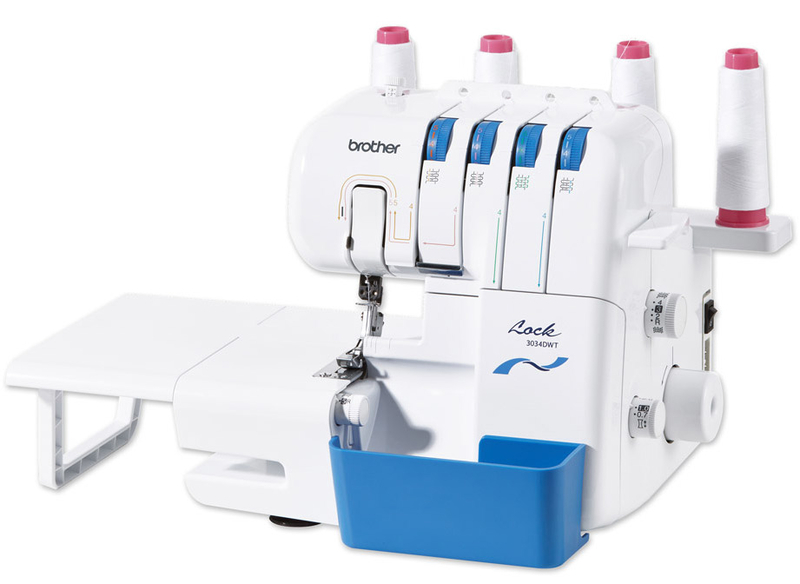 There are great accessories with this machine, some stored in the front drop down door in allocated click in slots - spare needles, a lint brush, a small screwdriver, a needle threader, a two thread converter, a 2nd stitch finger. There is also a nifty little slot that houses a measuring tape ( included!) , and above that there is a pad to stick your machine needle in if you are only using one needle so you don't lose it. The accompanying ziplock accessory bag contains a screwdriver, machine oil, a moving cutter, spanner, , tweezers, 4 thread nets , 4 spool discs, 4 spool caps, 4 spool holders. There is also a dust cover for the machine but to be honest I will prob make a more substantial cover that will also hold the foot pedal, the accessory bag , instruction book and scissors. ( I'm dying to make something!!) it's a sturdy machine, nice looking , it is set on 4 sucker feet and it doesn't budge when your using it. My daughter thought it was noisy but whether that is in comparison to ones she uses in college which would be in huge high ceilinged rooms or in comparison to a domestic sewing machine we are not sure. She says she will pay more attention to details when she gets back after the festive break. The noise doesn't bother us really as it is so quick you would not be spending ages at any one time , more like short bursts and it didn't interrupt the other people in the room from their conversation. There were also loads of complimentary threads, some needles and a pair of scissors which were all very much appreciated. I hope this review has not been too long winded but when you are buying without getting a hands on try of any machine you do look to reviews for insights to what a purchaser experiences . 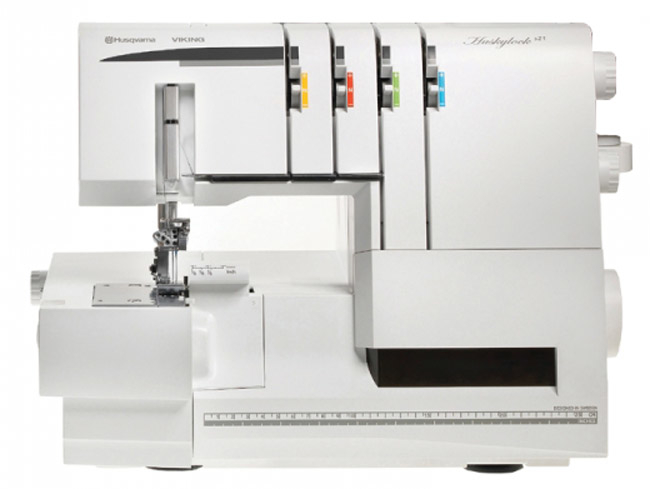 There are some great reviews on an American website sewing.patternreview.com for others out there looking for practical info on machines although some of the model no.s are diff to the European models but you can usually work them out. Anyway thank you GUR sewing machines I am delighted with your service thanks Billy for initially responding to my request on fb and a huge thank you to Steven for his input which was informative, helpful, patient and a big part of why I decided to purchase I would have absolutely no hesitation in recommending you to any of my friends or clients and have already recommended you to my sisters, friends and relations .